Hi guys! 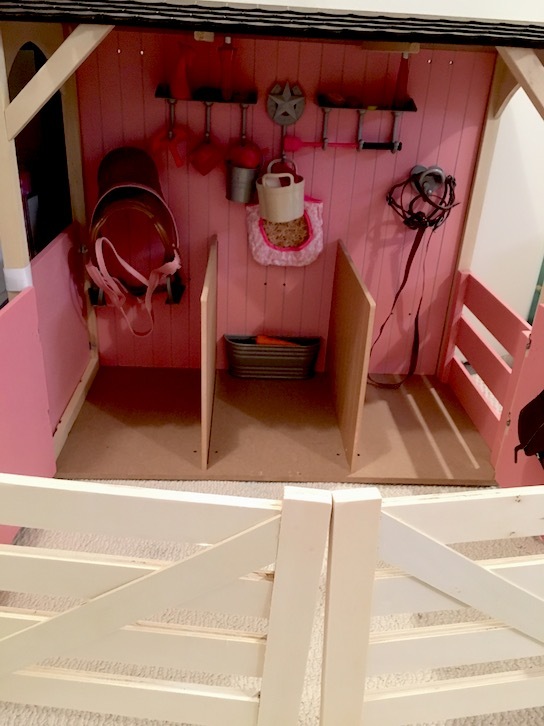 We are back with a review of the Our Generation horse stable! 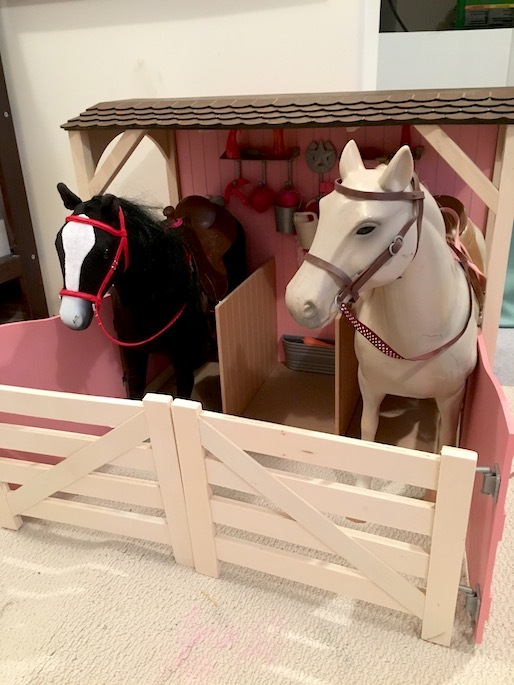 We received this stable for Christmas from Santa, and the Little Miss is very pleased. 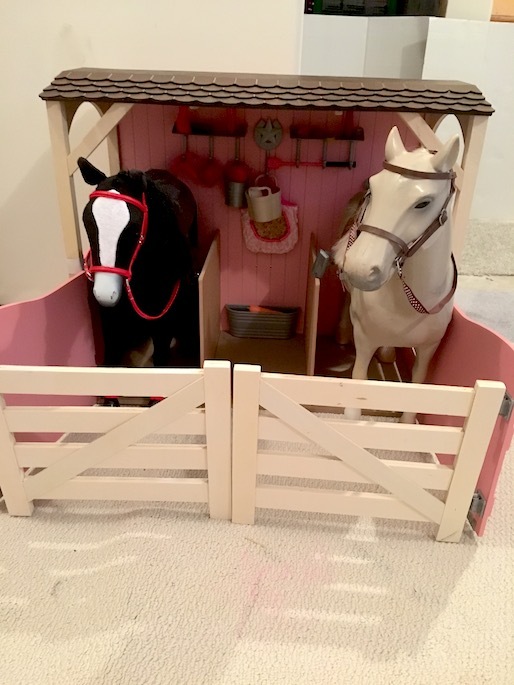 Our doll’s horses finally have a place to live! Onto the review! Let’s have a look shall we? Here is a view of the front. The doors to the stable open up, and there are two extra fence pieces that clip right on. I like this feature, because even though our smaller horse fits in the stable, the larger horse would not fit in the stable without these two extra additions. 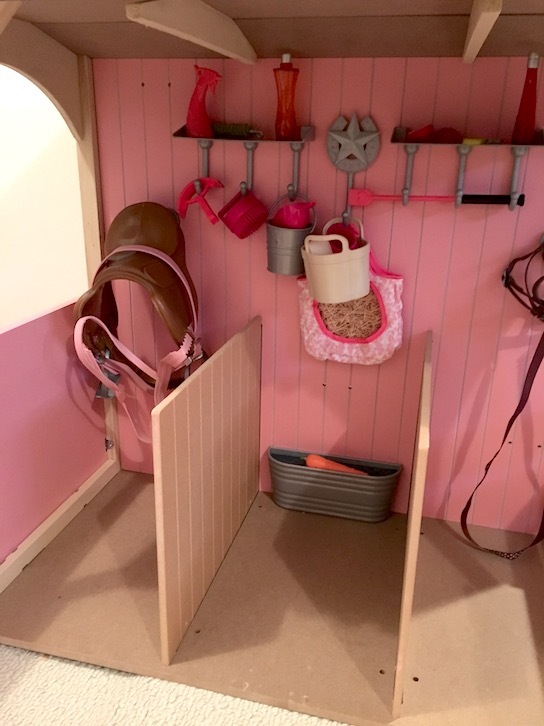 The stable walls are made of pressboard, but the fence pieces and the supports are made of wood. The floor is made of a sturdier pressboard, and the two dividers slide easily into place. As you can see, the quality of the wood isn’t the best, but it is lightweight which I think is important for doll items. The overall design is pretty good. 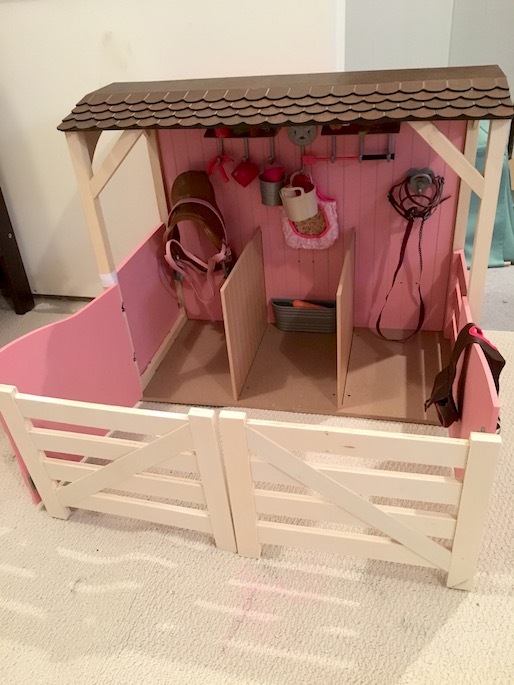 The stable is pretty sturdy as long as you don’t move it around too much. The hinges on the doors are kind of flimsy though. They are made of a thin metal, and I feel like a good bump could bend them or break them off. The shingles of the stable roof are also made out of very thin pressboard, so be careful. They can break off easily with rough play. Luckily, we don’t have any younger children in our house anymore. 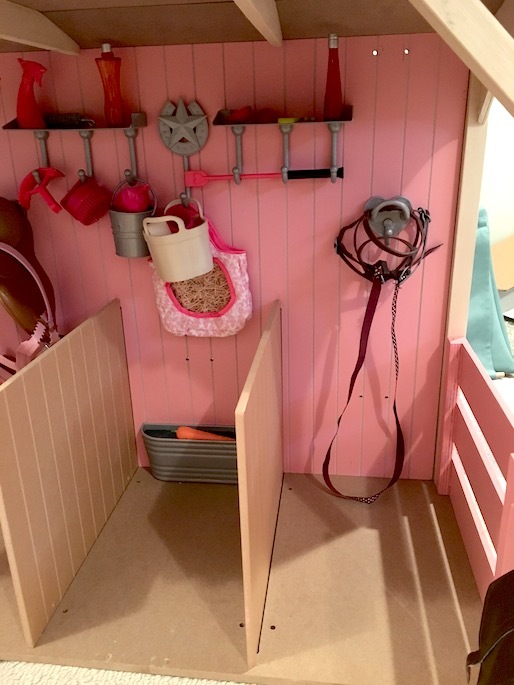 The inside of the stable is my favourite. There are tons of hooks and a couple of shelves that are perfect for holding all of the accessories. There is also a feed trough that is attached to the wall. There is already feed inside of it too. The feed is not removable, but treats can be laid on top. 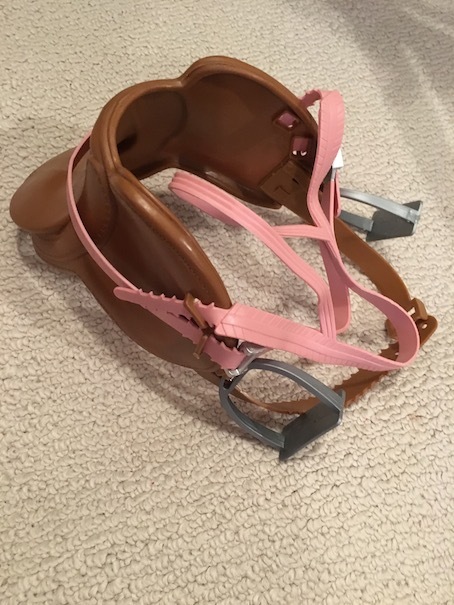 There are even saddle hooks which are important since this set comes with a saddle and a bridle. This is the bridle. Yes, I know what you are thinking. It’s what the Little Miss was thinking too. As soon as she saw this, she called it The Big Ball of Complicated. LOL! I set about to remedy the situation. I had to go online to find a picture of how to put the bridle on the horse properly, but after a lot of adjustment, and frustration, I surprisingly managed to figure it out. Here is Chestnut all decked out in his new saddle and bridle. The stable also comes with these saddle bags. However, Midnight has a better saddle to use these with. The saddle that comes with the stable doesn’t have a saddle horn on it. Okay, now let’s talk about accessories because despite the pros and cons of this piece, there is one thing that can’t be denied. I think I speak for doll lovers everywhere when I say that Our Generation really knows how to accessorize! 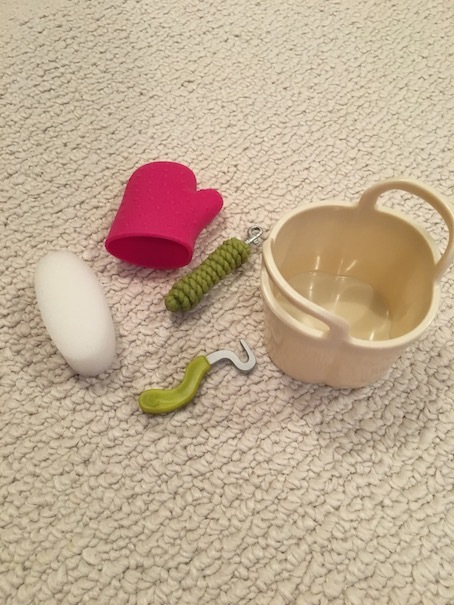 This set comes with everything your dolls could possibly need and more to feed, brush and care for their horses. Miscellaneous bottles. Not sure what these are for, but whatever. Still fun! 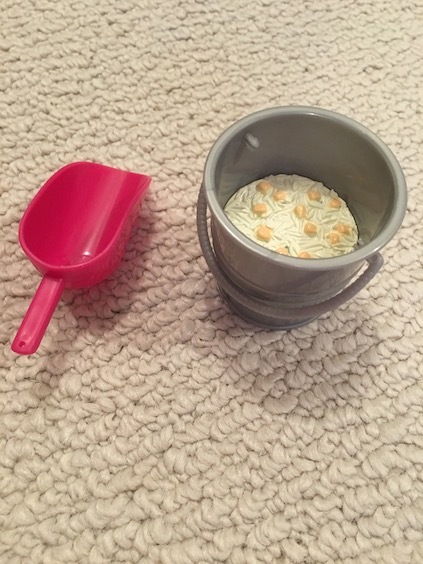 Feed bucket with scoop. The feed is not removable. Feed bag and horse switch. 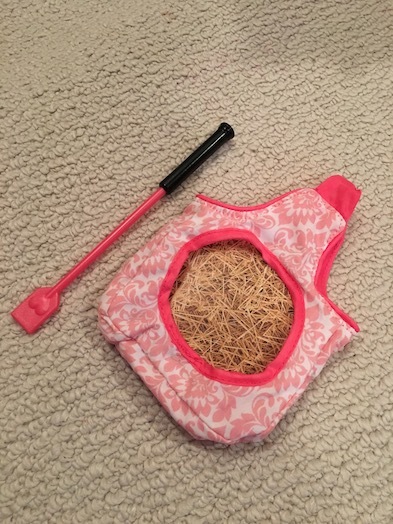 The hay inside the bag is just a picture on card paper but it is still pretty cute. The window is plastic and the bag opens so if you wanted to replace the paper with pretend hay you could. What did you think? 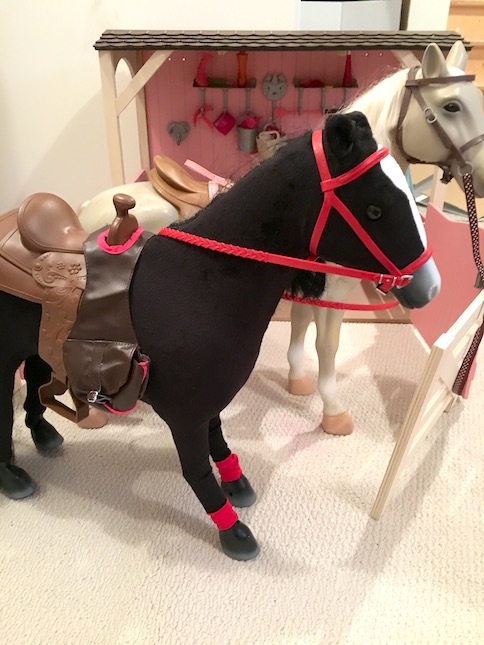 Do your dolls have horses? Next > WELCOME MARYELLEN LARKIN! Nicely done! Neat review. I see these in our Target frequently and agree about the hinges. Thanks! Yes, as long as you don’t move it around much the hinges should be fine, but I think they probably wouldn’t hold up to rough play. Okay–here goes. Yes, you did get the bridle on correctly, not bad for someone who had no idea what they were doing! 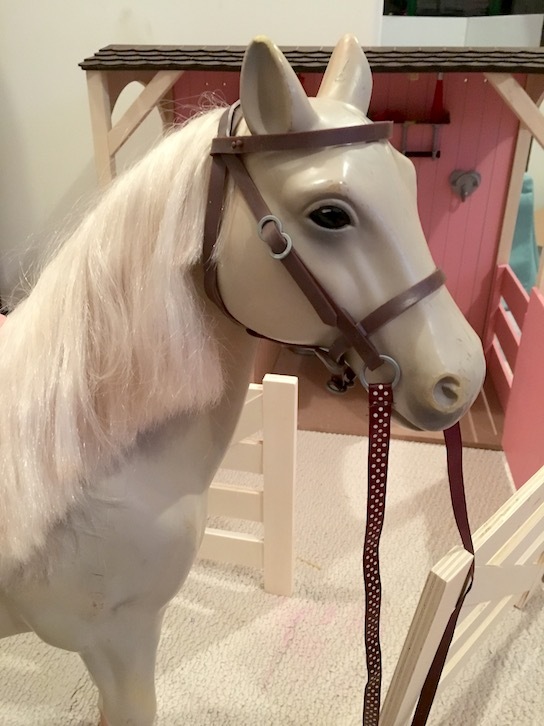 I’m glad you showed a photo of it on too because I have one that is missing the reins (the part you hold onto to guide the horse) and I like how it looks with ribbon, so that is what I will replace it with. 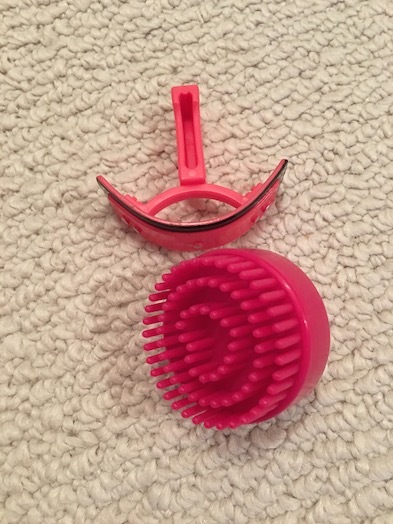 The round brush is a curry brush. The arched one is a sweat scraper, used to clean the salty foam and sweat that will form on a horse after it’s had a good workout. You don’t leave the salt on because it can be irritating to their skin and you want to get the sweat off to cool them off. (just like for us humans!) The lead clip is kind of a joke, it’s basically made to look like a rope that has been wrapped for storage, but to use it, you would unwrap it and the clip does attach to a halter or bridle to lead them from one place to another. (a halter is basically a bridle without reins, mostly worn when the horse is just relaxing in a stable or the fenced in area). 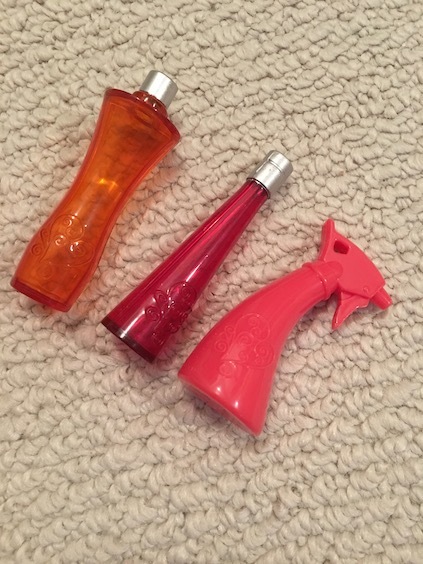 Spray bottles are found in every stable and used for a variety of things. The one I remember the most is fly spray, it’s something you can spray on a horse to keep the flies at bay. Kind of like OFF for horses. It has a distinct smell that you never forget, but it is a necessity. It’s also common place to keep some sort of “wound” spray around to apply to any nicks and cuts a horse may get from various things. A cut on a horse, particularly a leg, can be a very dangerous thing if it gets infected. Hope this helps! 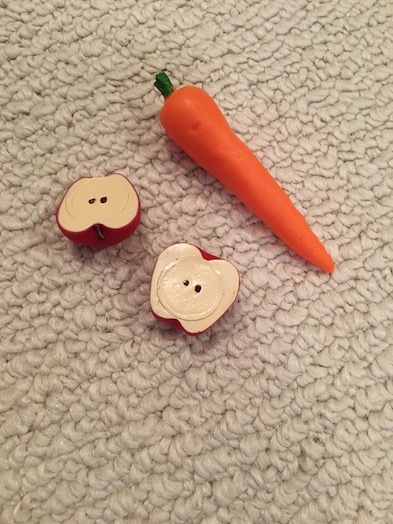 Adorable set, I’ve looked at it several times myself just because I love all the little accessories. 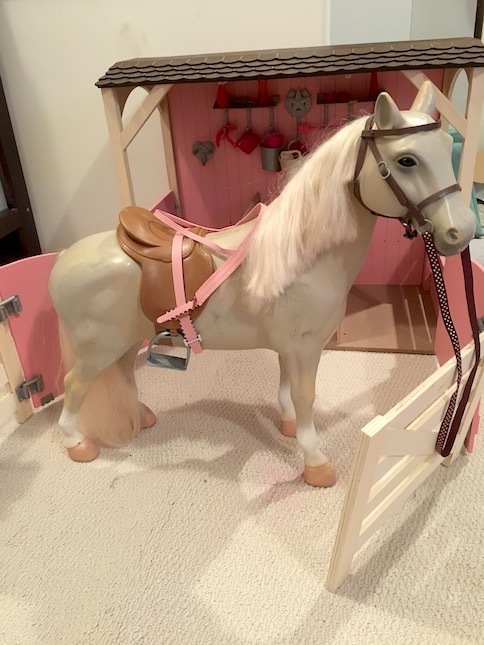 We have 3 horses for the dolls here, I’m currently in the process of customizing two of them to cover up some damages they have as they were thrift store finds. This. Is. Awesome!!! Thank you so much for all of the helpful information! That’s so odd that the lead should unwind, but since it doesn’t, it really just becomes a prop to store on the shelf. I recommend this stable as a great place to store horses. Otherwise where do you put them, right? Ours were just standing outside of the bakery before, and they were kind of in the way. 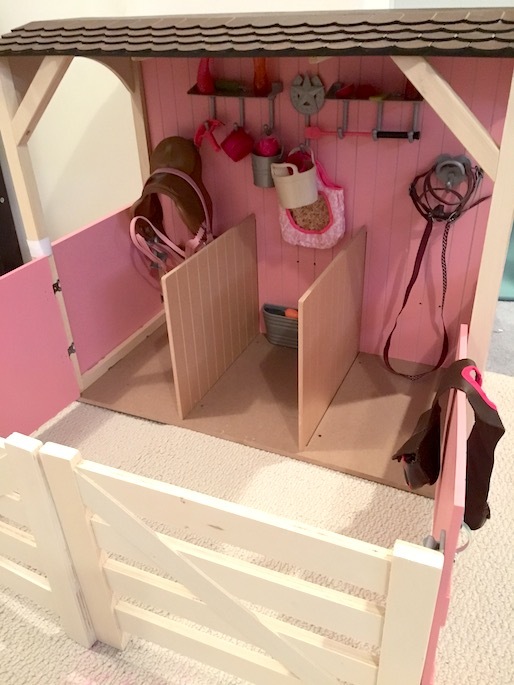 I saw the MyLifeAs barn over at KaitsAGCrafts, and it looks really cute too. I have the same stable and have no clue what those things are either! It’s a great little stable! It fits both of our horses wonderfully! The Little Miss has been having a great time spraying her horse’s hair down with the water bottles and letting them toss around the lead clip thing. I have no idea, but at least she’s having fun! LOL!